Besides the issue with Translation Manager we had another issue with creating new universe connections in the Universe Design Tool. When creating a new connection we had to wait up to 30 minutes ( ! ) to get to the wizard page where you can select from the list of available database drivers. Still, after 30 minutes everything worked fine and could create the connection successfully. Based on our experience with Translation Manager we run again TCPView and found that we need to assign a port number to both connection servers (32 and 64 bit) in CMC. Having done this, creating a new connection now works without any waiting time. There was a Google hangout session last week with Steven Lucas, President of Platform Solutions at SAP. 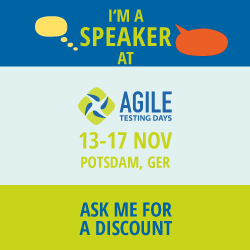 In this article I will summarize some key points from this talk and add my own thoughts. Have a look at the video at about 23:00. 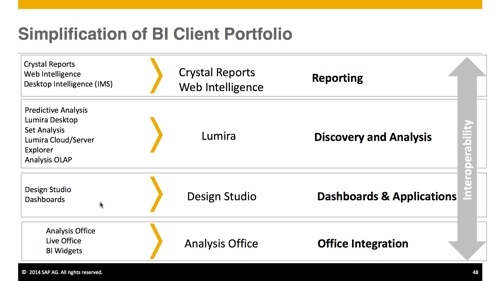 Steven mentions that there are currently 21 BI client tools in the BOBJ/SAP portfolio. 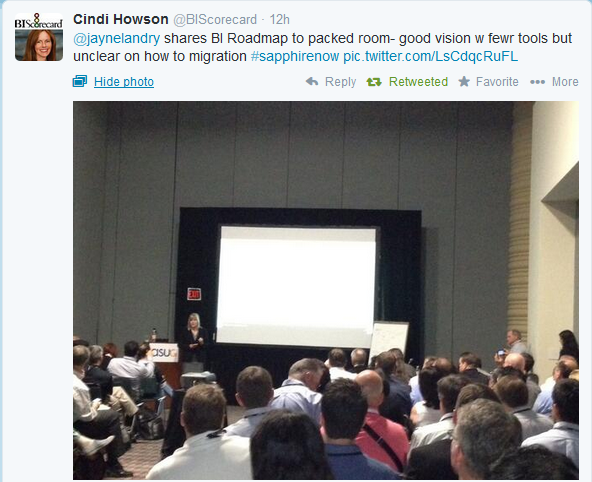 That’s why SAP already took the decision: “We are going to consolidate our BI tools”. In addition Steven mentions that they won’t deprecate core technologies like Webi or Crystal, but maybe integrate niche solutions like Explorer into Lumira. I personally like the statement about “feature preservation, not tool preservation”. Different cars for different purposes. Different tools for different purposes. 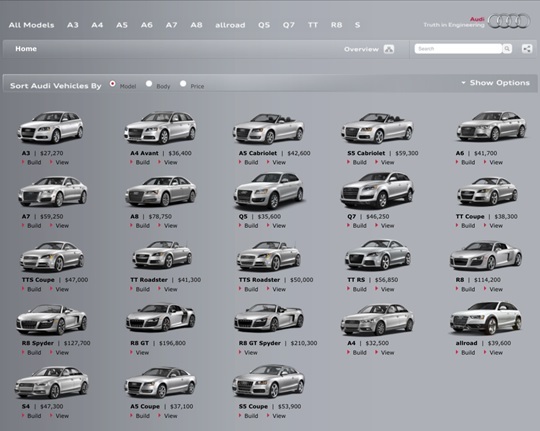 But what’s different between the shown car portfolio and SAP’s BI client portfolio? All the cars share some basic functionality like four wheels, a steering wheel, head lights etc. For the BI client portfolio we still lack some basic functionality to be included in every tool more or less in the same way: One main issue is the missing homogenity in terms of data access. For relational data the Universe might be seen as a common base. 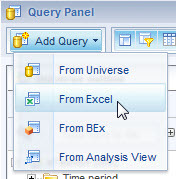 But not even 10 years after Crystal Reports was bought by BusinessObjects, and not even in the new Crystal Reports for Enterprise version which was built from scratch we see equality of how you can connect to datasource compared to e.g. Web Intelligence. The same with BW connectivity. When I was at the sapInsider conference BI2014 two weeks ago at Nice / France, I had to learn once again from Ingo Hilgefort that Web Intelligence lacks some basic functionality like Zero Suppression even now having BICS based direct connectivity to BW. 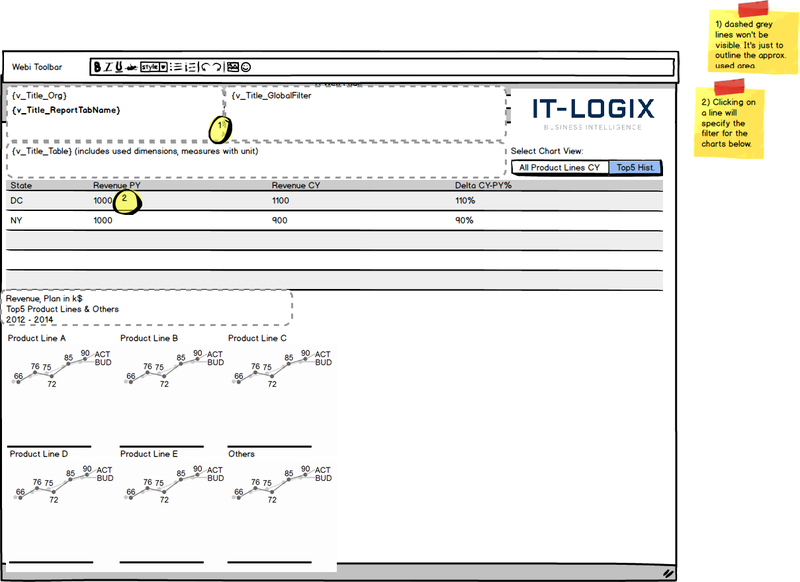 The same with HANA connectivity where Crystal supports HANA connectivity using an OLAP connection but Webi doesn’t. The same with Web Services connectivity and I cut continue the list for a while. From an architectural perspective I just ask: Why? 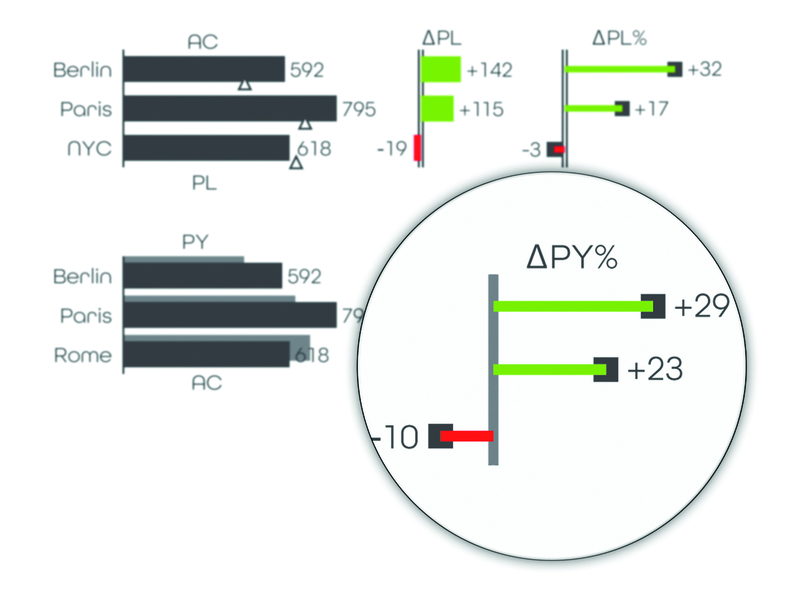 Another commonly cited issue is the charting library. 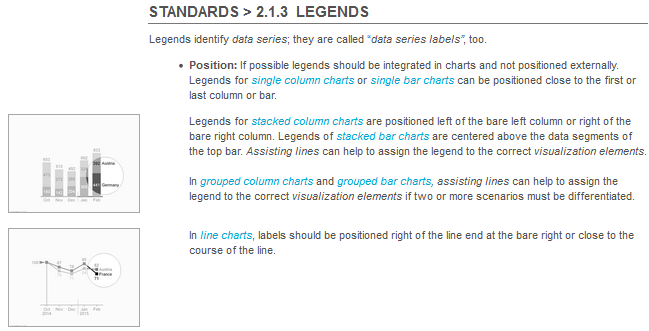 Still there is nothing like common charting capabilities, the different tools still differ quite heavily in terms of what they provide as chart types and options, not to talk about the missing option to plugin a custom charting extension to all BI tools but only specific ones. To sum up this first part: SAP’s job isn’t done by simply reducing the number of tools. They need to make sure that the remaining tools share some commonly expected features. Don’t let data connectivity or charting options be the differentiator between the different client tools. Merge Crystal Reports into Web Intelligence: I know, according to Steven’s statement above this won’t gonna happen as Crystal is considered a core technology. Still, give this thought a chance. 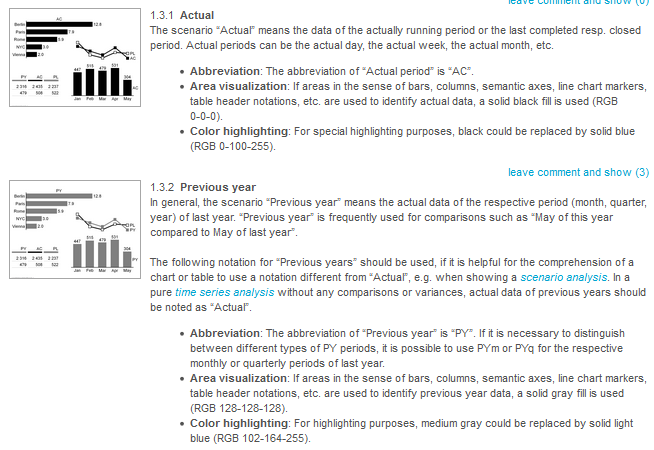 There isn’t that much missing between Crystal Reports and Web Intelligence from a feature perspective. 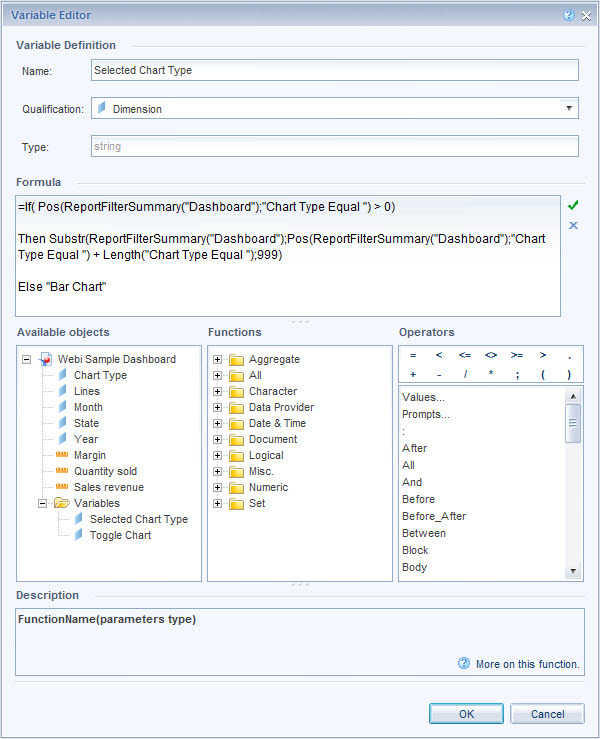 Conditional formatting, interactive alerts, some more export formats, hierarchical grouping for relational data and a more powerful formula language. 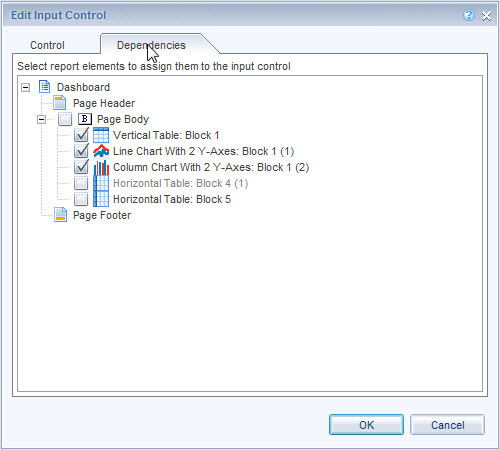 Being a Crystal Reports consultant for more than 12 years I’m not really happy with this thought in a first instance as I really like the tool. 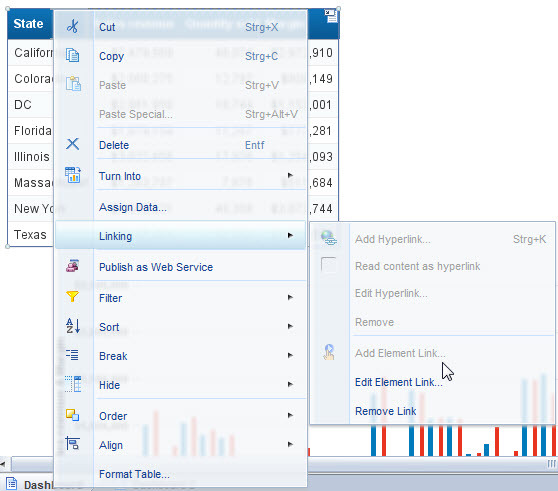 But if imagine how I could leverage certain Crystal Reports features with the powerful capabilities of Webi, it sounds very promising to me. 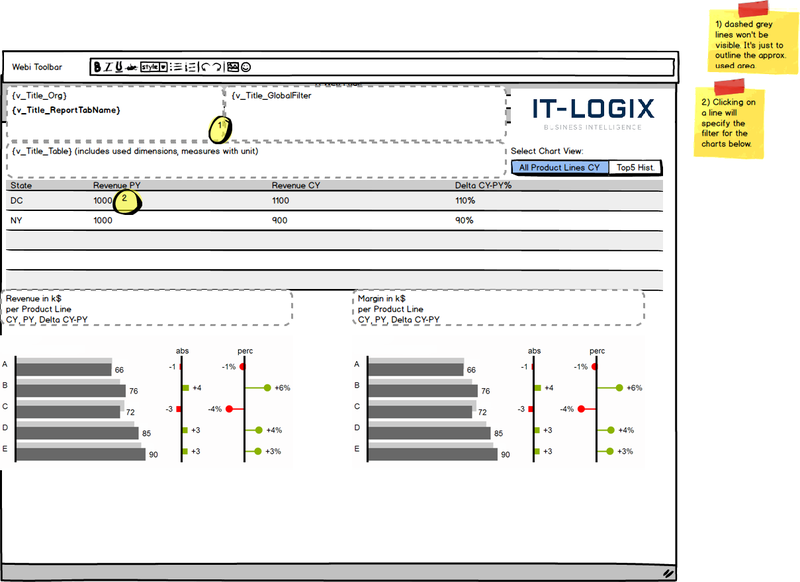 Merge BO Dashboards / Xcelsius “visuals” and input controls into Web Intelligence, Design Studio and Lumira: Stop the thinking that “a dashboard” is a matter of the tool. 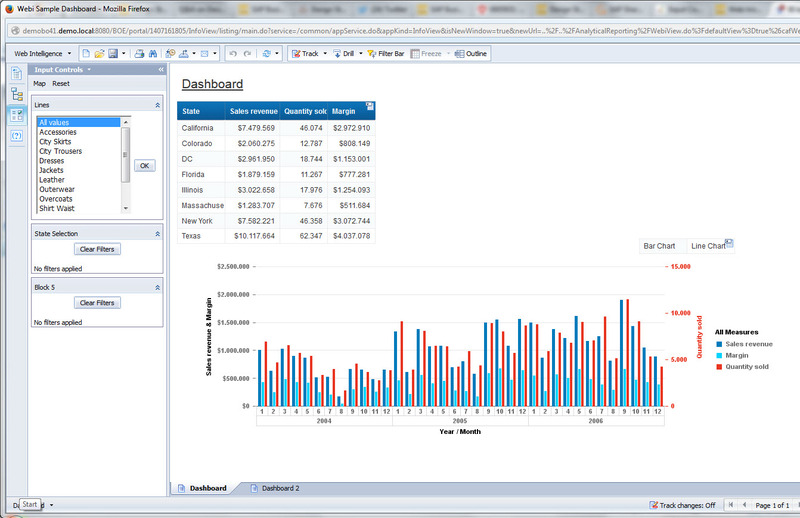 From a business perspective a dashboard has more important elements than just to be fancy and highly interactive. 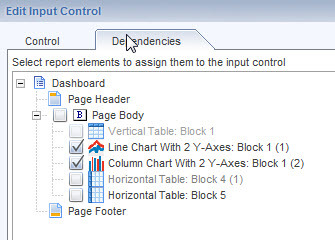 Depending on the business requirements you can build a dashboard in many tools including Design Studio (more app style dashboards), Lumira (more the ad-hoc kind of dashboard) and Webi (if you want to have more sophisticated data capabilities and the fully fletched platform support like scheduling / publishing, control user actions with rights etc.) 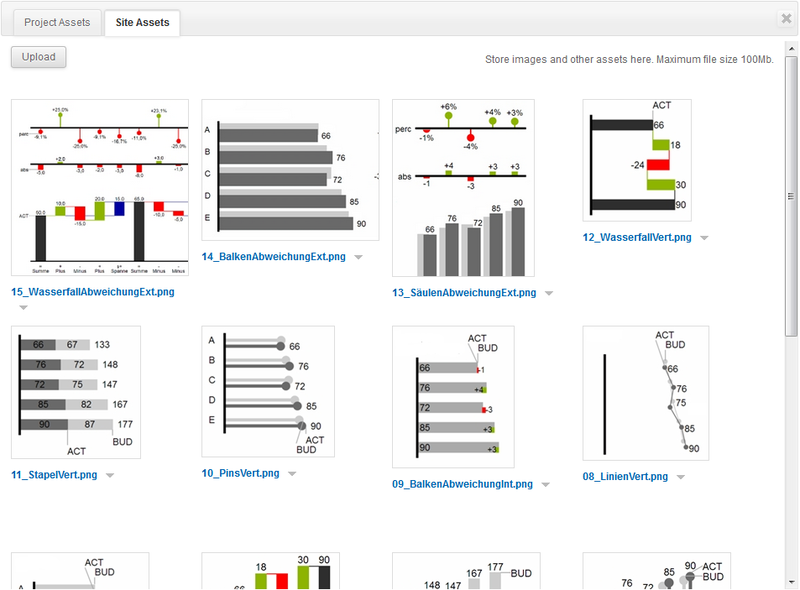 So please share the visual components we find in BO Dashboards today to various tools like Webi, Design Studio and Lumira. 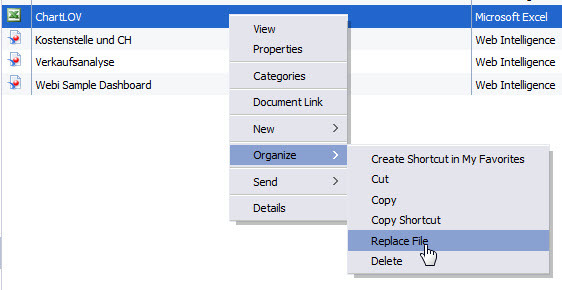 Merge Explorer and Lumira – and think about the “feature preservation”. 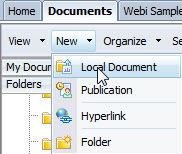 Don’t forget to add the “Export to Webi” somehow to Lumira. Merge LiveOffice into BO Analysis, Edition for Office. LiveOffice is still very powerful, but I think we don’t need two separate add-ons. 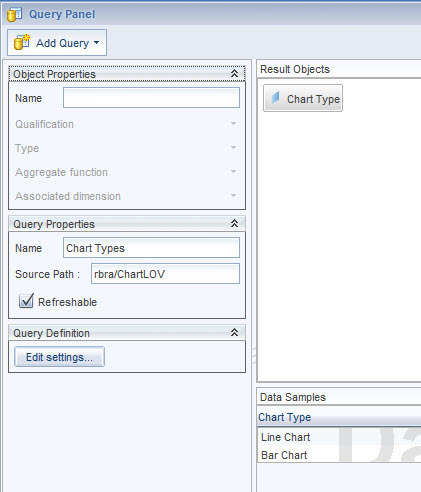 Merge Analysis OLAP into – I’m not sure, as I’m not very used to this tool. Regarding the BW connectivity issues I’d like to see the Analysis OLAP capabilities in Webi. 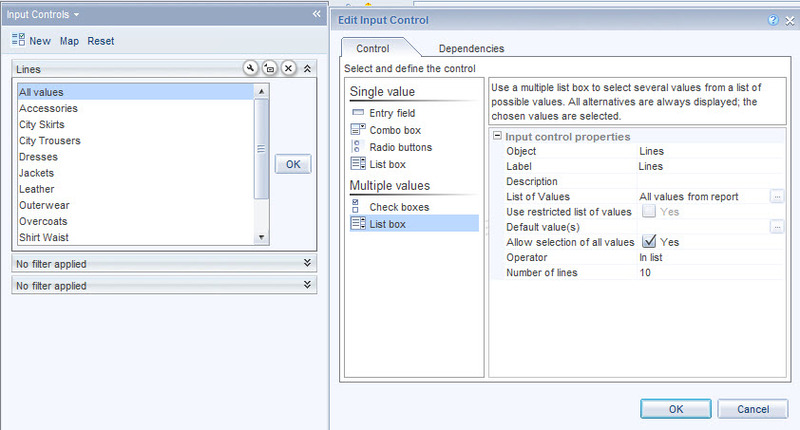 And / or you can add an OLAP grid / control to Design Studio. 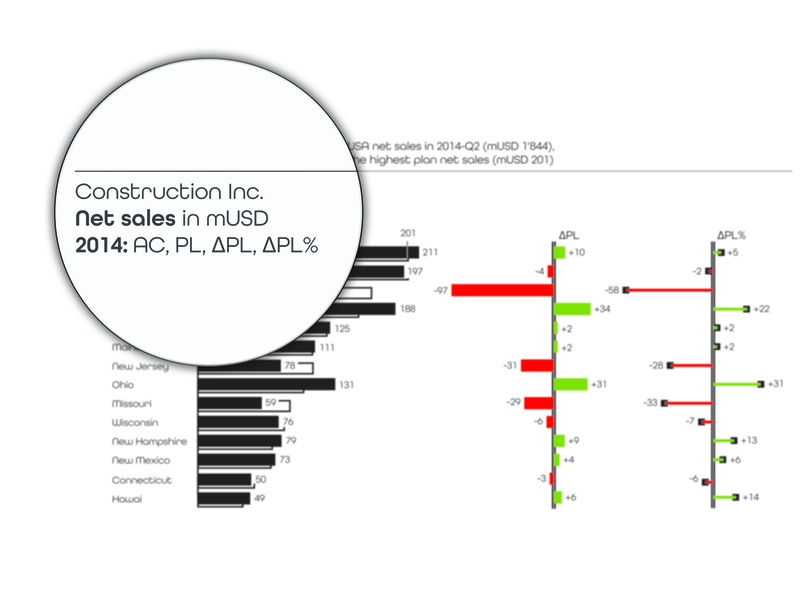 Merge the predictive tools like Infinite Insight and Predictive Analysis into one joint tool. How do you rate my wishlist? How does your wish list looks like? I’m looking forward to reading your comments soon! 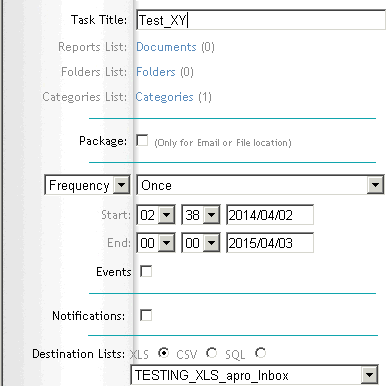 Report selection for a schedule job can be done using good old BO categories. That means you can assign e.g. a test category to all reports you want to test in one single run. In our customer case we use categories for each data mart. In 360Cast, instead of choosing every single report individually, we just choose to select all reports of this test category. To provide prompt values 360Cast accepts both manual input values (where a value can be applied to a all prompts with the same name) but also values from an Excel sheet (or even from an SQL query). We usually use the Excel alternative. 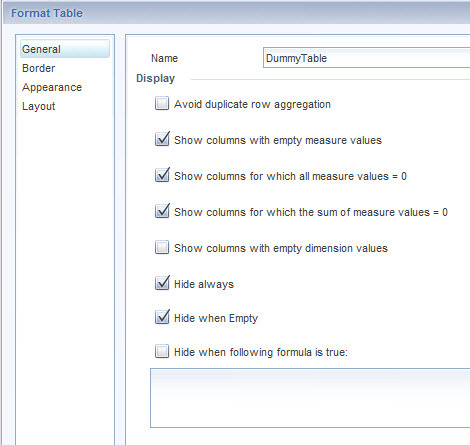 Based on this we can easily vary input parameters for different test purporses by simply using another Excel sheet. In addition we can specify the export format and the recipients, e.g. by providing an email address. After all, also 360Cast doesn’t solve the initial problem. But at least we don’t need to run every report (identified by 360Eyes earlier) on its own but can automate the refresh process and we can easily rerun reports (e.g. 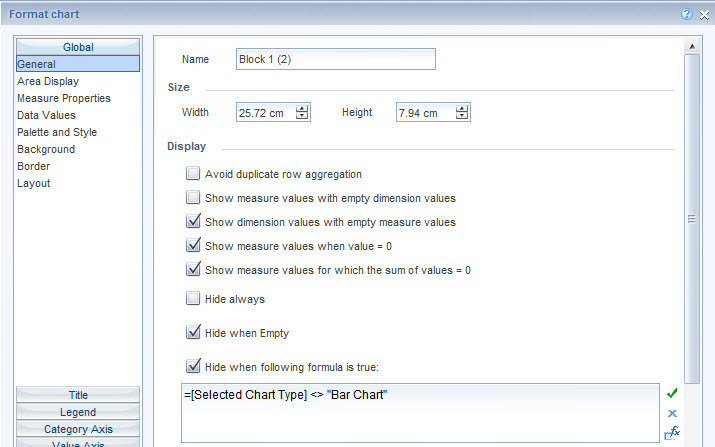 with different prompts by simply modifying the values in the Excel list).